The 5th Annual Pride Night with Ohio State Men’s Hockey returns Saturday, February 25, 2017 vs *ichigan. PRIDE NIGHT TICKET SALES ARE NOW CLOSED – THANK YOU FOR YOUR SUPPORT AND WE’LL SEE YOU AT THE SCHOTT! GO BUCKS! 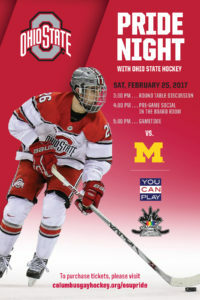 All tickets will be held at the Will Call station in the NorthWest Rotunda of the Schottenstein Center under the purchaser’s name. Thank you to our Hat Trick Sponsors for their support of our events! Thank you to our Community Partners for their continued support!